In about eight months, the Australian Labor Party and the Liberal Party will war at the ballot box for the state of NSW. Corflutes will be mounted, flyers distributed, telephone numbers dialed, and meals interrupted. The foot soldiers of the operation will be the parliamentary parties’ respective youth wings: Young Labor and the Young Liberal Movement. Recently, the NSW State Conference showcased the best of the worst of the Labor Party: inter-factional squabbling, ideological gulfs, and abrasive and very public sledging. The factions, Centre Unity (Labor Right) and the Socialist Left (Labor Left), were noisy and visible. On the other side of the fence, however, one hears little and sees less. The Liberal Party has an adroit capacity for suppressing public dissent about internal issues, particularly among its younger members. Former President of the Sydney University Conservative Club Brigid Meney cited this “very strict media policy” when she declined to be interviewed for this feature investigation. To the public, the pews of John Howard’s broad church seem deathly quiet. 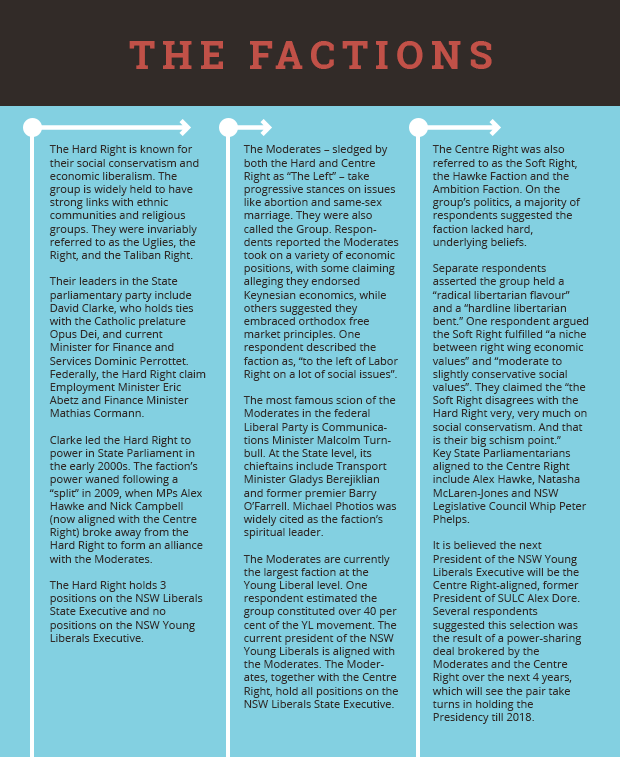 A variety of sources close to the Young Liberal movement spoke to us about the clandestine operations of the factions, the Sydney University Club (SULC), and the Young Liberal movement – albeit on the condition of partial anonymity. Corroborating evidence in leaked emails and excerpts from the club’s constitution and meeting minutes flesh out the rest of the saga. On a campus level factional brawling has historically taken place behind closed doors in tensely stacked-out annual general meetings. Following the Centre Right’s victory for the control of SULC in 2011, the battleground has moved to O-Week stalls and social events, where factions vie to recruit new members. A scuffle at this year’s O-Week between members of the Centre Right-aligned SULC and the Hard Right Conservative Club underlines the hostility between two battling factions. The clubs’ stalls were initially placed side by side, but by Thursday were inexplicably separated. Despite mounting evidence that an altercation took place, the President of the Conservative Club and the President of SULC issued a joint statement denying any hostility between the parties. The true story was borne out in the minutes of a University of Sydney Union Clubs and Societies (C&S) Committee meeting held in May. “[Conservative Club President Chaneg] Torres says the Liberal Club were acting aggressively towards them during O-Week. He says they have photographic evidence and O-Week Directors had to tell them several times to stop,” the minutes of the meeting read. Emails sent by Dore, obtained by Honi Soit, also indicate the Centre Right’s general wariness of rival Liberal factions on campus. “We need to keep monitoring the Group [Moderates] and Tali [sic] on campus. I’ll chat with [REDACTED] about [REDACTED] – the more we can ostracise him in college, the better,” Dore wrote in May 2012. The “Tali” referred to in the email is short-hand for the Taliban Right, a nickname for the Hard Right. Though Margaret may distinguish the alliances of the Liberal Party from the “institutions” of Labor Right and Labor Left, the divisions in the Liberal Party and its youth wing, the Young Liberal movement, are certainly real and allegedly vicious. For the past 50 years the frontbench of the Federal Liberal Party has contained at least one former SULC member. The consensus among the those interviewed is that three “factions” exist within the Liberal Party: the Hard Right, the Centre Right and the Moderates. Every person interviewed confirmed the existence of these factions. Some however, like Margaret, denied their rigidity. Characterisations of the Hard Right and Moderates’ ideologies were largely consistent and undisputed by everyone we interviewed. The Centre Right, on the other hand – the dominant force within SULC – is the youngest of the bunch and emerged the least well-defined. Since its inception, SULC has remained one of the most powerful student Liberal Clubs in Australia. For the past 50 years the frontbench of the Federal Liberal Party has contained at least one former SULC member. Though the Centre Right lacks force at the State level, their ability to wedge the Hard Right and the Moderates in the Young Liberal Movement has rewarded its fledgling lieutenants. Former NSW Young Liberal President Simon Fontana, former SULC President Alex Dore, and former NSW Young Liberals Metropolitan Vice President Tobias Lehmann (who shared his position with Dore) are all members of the Centre Right. Dore is tipped to be the next State President of NSW. Claire*, a former member of SULC and the Young Liberal Movement, described the Centre Right as “the Ambition Faction, because they’ll work with either to get what they want.” This epithet was repeated, without prompt, by separate parties – albeit from rival factions. Defenders of the Centre Right assert the faction fills a niche between the Hard Right and Moderates. A former member of SULC, aligned with the Centre Right, said “the Soft Right has the broadest ideological base for people who find either of the two other factions uncomfortable”. “SULC is very much the base of the Soft Right at the moment,” said Arthur*, a former executive member of SULC. “It brings in around 100 forms per year.” SULC holds significant power in the Young Liberal movement; its status as the premier Liberal Club of Sydney University makes it a powerful base for recruitment into the movement and the Centre Right. Estimates by a variety of sources suggest that student organisations represent 30 per cent of total party sign-ups. It’s worth noting that recruiting students to youth branches is not unique to SULC. Claire alleged the practice is “commonplace from what I’ve seen for the political clubs to sign people up to their respective youth branches”. Several sources contended recruitment is an inevitable consequence of hosting political clubs on campus. University clubs like SULC are particularly significant for the party’s upstart Centre Right faction. Arthur explains the Moderates’ sizeable amount of MPs in parliament gives them access to high schools, a significant source of recruitment, while the Hard Right naturally draw members from churches and religious institutions. The Centre Right, however, lacks these particular historical and institutional advantages, and instead relies on politically active campuses like USyd and UNSW. Honi understands that members of the club’s executive obsess over securing factional support from ‘high potential’ new members or, as they’re referred to internally, HIPOs. A number of former SULC members have attested to the high ‘churn rate’ of SULC membership, resulting in many members falling out of the faction. Securing the support of new, charismatic members is therefore crucial to furthering factional interests. An internal document sent out to senior members of the Club prior to a new members’ night in 2012 suggests the priority when talking to new members should be to “make them solid supports [sic] of the Centre-Right”, and to “make them want to get more involved in the party”. Senior members in attendance at the drinks were then expected to provide written reports on the people they had met. The internal document also appears to reveal the Club’s intense suspicion of opposing factions. It recommends that, although “the Tali or the Left” are not expected to “send operatives” to the event, the senior SULC members should be “on … guard in case someone is a mole”. Two Rights Make A Fight? 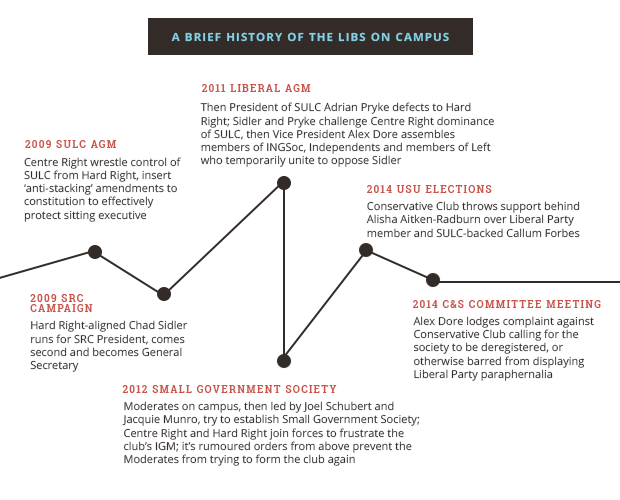 “It [SULC’s complaint made to C&S] really reflected that they [SULC] have concerns about the Conservative Club gaining influence over the right-wing student circle at Sydney University and tapping into that base,” he said. Despite reports of the heated nature of the committee meeting, a spokesperson for the Conservative Club denied allegations of disunity between the two clubs. “The Sydney University Conservative Club looks forward to continuing their amicable relationship with the Sydney University Liberal Club to oppose the radical left on campus, and in Australian culture generally.” When asked about the clubs’ relationship, SULC President Will Dawes referred us to the statement provided by the Conservative Club. To be elected national President of the Young Liberals is to join the ranks of Liberal Party elite. With the position comes authority and access; the President holds a vote in Federal and State pre-selection and routinely rubs shoulders with senior party players and operators. Despite these perks, Margaret said the presidency is “not a hardly coded position of power, it’s more a representation of power”. Along with the prestige, the presidency brings with it functional, factional value. “The President of the Young Liberals has access to the referral system,” Arthur said. Allegedly, this allows the sitting king to direct new members to specific, faction-aligned branches. “You could game that system a lot more effectively, if you were in control of it,” he said. There are over 50 branches in which Young Liberal factions do battle. These branches play a pivotal role in the election of the State and National Young Liberal Executive, including the Presidents. A branch is given a delegate for every ten members it has. A typical branch hosts 30 to 40 members. The number of delegates is capped at six per branch. Given the electoral power of individual members through this branch structure, every sign-up matters. Branches vote for branch delegates, who, in turn, directly elect the State Executive. Several respondents alleged SULC actively recruited members to the Young Liberal movement and referred them to Centre Right-aligned branches to boost the number of allied delegates they held. New recruits to the Young Liberal movement can be directed to branches by request, or through an online referral system. A majority of prospective members do not typically know the names of branches, let alone the factions that operate them, Margaret claims. “It’s really quite beautifully subtle,” he added. A set of peculiar ‘anti-stacking’ measures introduced into the SULC Constitution in 2009 have enabled the Centre Right to retain power over the club’s Executive and successfully bat away a number of factional challenges. According to Dawes, these constitutional mechanisms were “recommended by the C&S Office” to “deter stacking”. Their aggregate effect, however, has been to not only to deter cynical factional rivals, but to preclude legitimate challenges to Centre Right control. The Constitution is nearly impossible to obtain through official channels. Repeated requests from Honi to Dawes, SULC Secretary Joshua Crawford, Immediate Past President Alex Dore, and the C&S office were ignored. One of the more controversial ‘anti-stacking’ measures in the Constitution is the ‘two signature’ rule. Section 4.2 of the SULC Constitution states that every new member of SULC must have their official membership form counter-signed by both the SULC President and Secretary. To Honi’s knowledge this measure does not exist in the constitution of any other society. Claire alleges that in 2012 she witnessed members of the SULC executive cross-checking member signup forms with the Facebook profiles of new members. If such prospective members were friends with well-known Moderate-aligned students, she explains, their applications for ordinary membership of SULC would not be countersigned. Dawes denied the allegations in a statement to Honi. He said the assertion that “particular students have been refused membership based on affiliations or exclusivity” was “totally incorrect”. Additionally, a former member of SULC said the allegations were “simply not true”. The provisions were “designed to prevent individual members of the SULC executive from arbitrarily adding people to the membership register”, they said. There is no doubt the factional intrigue and knife-fight politics of SULC extends beyond campus. An email sent by Dore in September 2012 implicates his involvement in the affiliation of a “Centre-Right UNSW Liberal Club”. Earlier this year Dore, Dawes, Crawford and Dean Shachar (current SULC Vice-President) attended the IGM of the UNSW Conservative Club. Tharunka reported their presence was part of a larger movement to “prevent the Conservative Club from forming on campus due to [its] perceived connection with the hard right, religious faction of the Liberal Party”. Young Liberal lieutenants are frequently employed as staffers for MPs. Members from all factions accused each other group of allocating staffing jobs based on factional nepotism. Honi has been unable to verify these accusations. The Liberal Party’s broad church knows to keep a tight lock on the feuding within its house. Young Liberal Elliot Donazzan was threatened with a five-year expulsion from the party for advocating internal reform and starting a website, entitled “Young Liberals for Democracy”. One respondent informed us “the party” was cracking down and would be unable to answer simple follow-up questions. Another requested we destroy our recordings and transcripts upon the article’s completion. It is often assumed that students progress from university politics to party politics. In reality, they’re one and the same. SULC President Will Dawes declined to be interviewed for this piece. He declined to comment on the allegations raised, beyond a general statement. Former SULC President Alex Dore also declined to comment.